Research libraries have sometimes been called the collective brains of humanity. It is certainly true that, like a brain, a research library tends to have both well-lit rooms where information is efficiently organised and clearly labelled and dark, distant chambers where materials lie waiting to be sorted and studied. Just as a brain requires both its conscious and unconscious parts to function properly, so a research library needs both its shelved, easily accessible secondary literature and its stacks of unpublished manuscripts and cases full of of rare and fragile books. Without the obscure primary material - the letters from soldiers and the diaries of explorers and the memos drafted by long-dead politicians - the confident judgements of new textbooks and the fashions of academic literature cannot be tested and, if necessary, overturned. Many Kiwis assume that the bunkers of Wellington's Turnbull library are this country's sole repository of unpublished documents and rare books, but most of our university libraries and many of our larger public libraries have interesting and important collections of primary material stashed in their backrooms and basements. The University of Auckland library has a particularly large archive. Over the years I've made a habit of turning up in the library's special reading room and pestering the staff there by asking them to fetch this or that document from the dark recesses of their domain. I've asked for, and received, crumpled communist newspapers from the 1920s and '30s, grumpy letters from eminent New Zealand poets to their patrons, unpublished novels by unknown authors, private archaeological reports on artefacts discovered in the swamps of the Kaipara, and confidential memos from the leadership of the New Zealand Legion, the proto-fascist organisation which grew with frightening speed during the early 1930s before mercifully imploding. In our era of economic uncertainty, steep student fees, too-short semesters, and distracting digital technology, many university students adopt an instrumental approach to research. They advance dutifully through textbooks and fashionable texts, making bullet point summaries on their i pads, but rarely stray from their prescribed reading. Explorations of old and strange books and unpublished documents must seem an impossible luxury, when essay deadlines are pending, rent payments are overdue, and loan money is running out. In recent years the University of Auckland's librarians have set up a blog to remind students and the general public of the institution's archives, and staged a series of small exhibitions on the ground floor of the library to show off taonga from the storage rooms. I made a rare trip to the library last Friday, in an effort to hunt down an obscure text by Futa Helu for the book of the great man's writings I'm helping to launch on August the fourth. I couldn't find the text in question, but I did discover a large glass cabinet filled with old books and pamphlets, unpublished manuscripts, posters, and other material related to Samoa's epic struggle for independence from New Zealand in the first half of the twentieth century. 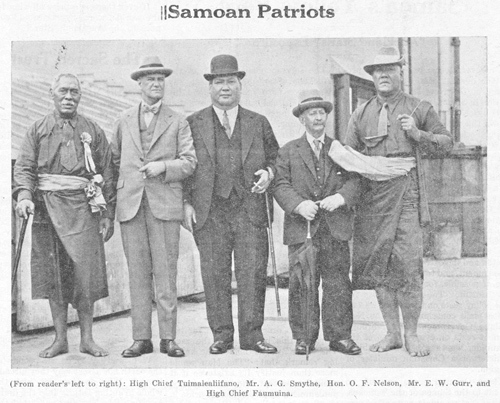 An open letter in which Olaf Nelson, an 'afakasi trader and leading member of the Mau movement, addressed the League of Nations about his country's plight sat close to The Revolt of the Samoans, a pamphlet by Harry Holland, the first leader of the Labour Party. As well as old documents like these, the exhibition showed off some recent academic research into colonial Samoa, like my friend Alex Wild's Masters thesis "There is no War Here: German portrayals of the New Zealand occupation of Samoa, 1914-1920". Alex wrote her thesis after sitting down in the air-conditioned backroom of Apia's Olaf Nelson library and reading her way through the diaries and letters of German colonists who were stranded for years in Samoa after New Zealand troops arrived early in World War One. Alex discovered, in these long-neglected texts, an unflattering portrait of Kiwi colonialism. I've published an excerpt from "There is no war here" in the new, Oceania-themed issue of brief. Next to the cabinet a slide show played on a computer screen, and a pair of headphones dangled in the air. I put the headphones on while I watched the show. As sunburned Kiwi soldiers with bayoneted rifles escorted surly men in lavalavas down a road between banana palms, one of the anthems of the anti-colonial Mau movement began to pour into my ears. I was so preoccupied with the sounds and sights of Samoan history that I didn't notice when Judy McFall-Taligau, the university's Pacific librarian and an expert on the history and languages of Western Polynesia, approached me from her nearby office. Judy is closely involved in a contemporary protest movement, the Leo Pacific Bilingual Language Coalition, which has been campaigning for the official recognition and proper funding of Pasifika languages by this country's government. Together with her husband John McCaffery, she wrote a complaint to the Human Rights Commission over the neglect of Pacific languages, and I've republished some of this long and angry text in the new brief . After I'd finally taken my headphones off, Judy explained that she'd created the exhibition about Samoa's freedom struggle to coincide with the recent fiftieth anniversary of the country's independence from New Zealand. Judy said that, because most of Auckland's students were away on holiday, she was thinking of taking her exhibition down. I persuaded her to hold off for a few days, because I was sure that a few readers of this blog would like to pop in and take a look at the taonga she had collected from her library's archives. Just before last semester ended I dropped by and had a good look at the Samoan independence exhibition in the General Library. Was really good. The uni librarians quite often do some good displays. They had a great Tariq Ali one just before he came to Auckland uni last year. lol tariq ali...a self-confessed extremist! do these people always push left-wing propaganda??? I just had look at Tariq Ali's bio on Wiki and he seems to be or have been an activist and to have done quite a lot of good in the world. (It's true he blundered by becoming a Trotskyist [cant resist] but he satirized them I think (!)... ); but would anonymous rather he was a Do Nothingist? By "extremist" of course you mean he had a conscience and felt that (for example) the US murderers in Vietnam and Iraq were wrong to be in those places...in other words he cared. So, because he cared he took some direct actions and wrote books and so on. And who are "these people" - do you mean everyone who comes on here and either agrees with (more or less) or has some "resonance" with Maps is in total one to one concurrence with everything he says (and everything every one else says ..) and always advocates extreme actions? And now that you have picked that out, what has that got to do with the availability of history of interest at the Auckland University? Or Cameron's endorsement of that fact, and it's good to see him say that. I notice that right wingers are almost always cowards who hide behind anonymity. Or is your "extremest" comment directed toward the idea of freely allowing people to learn about Samoa's history which includes the Mau movement and also includes NZ's and Germany's involvement with that history, as Alex Wild points out in her discussion of all this in the latest Brief? Or learning about other aspects of history hard to access through other channels? ahhhhh. A university library. Lucky. I owe you an email Scott, because I completely forgot to send you the books for Tonga. SO how would Samoa ever have won its independence if it had not fought politically for it?